Challenge 1, sponsored by ORLY, asked our Top 12 to create gel art using Builder in a Bottle. They had to extend, encapsulate, and embellish the nails for a clearly gorgeous look. The contestants then created a video diary showing the process for the extension, embedding, and at least one embellishment. This week’s guest judge was Shanee Pink of Orly. Ashton: Icicles and roses may not go together in nature, but your fusion made them work — and look beautiful too! The saran wrap technique was a judge favorite. Jenna: You made steampunk cinematic with your trademark presentation. The pro tips in your tutorial were also a nice touch. Kelsey: The judges agree that you are a gifted sculptor, but would have liked to see more embedding in your design. Bojana: The judges thought your inspiration was genius and loved the lightbulb. For the next video, get straight to the action and avoid most or all of the narration at the beginning. Carly: You did Orly proud with the story behind these nails and the ribbing effect. Watch the dust when you work and pay more attention to nail structure. All in all, really great ideas! Emily: Your crystal creations are brilliant! However, the design may have been a bit too repetitive. Next time, consider varying the design or explain more about why you kept it the same on every nail. Lorna: You sure know how to tell a story! 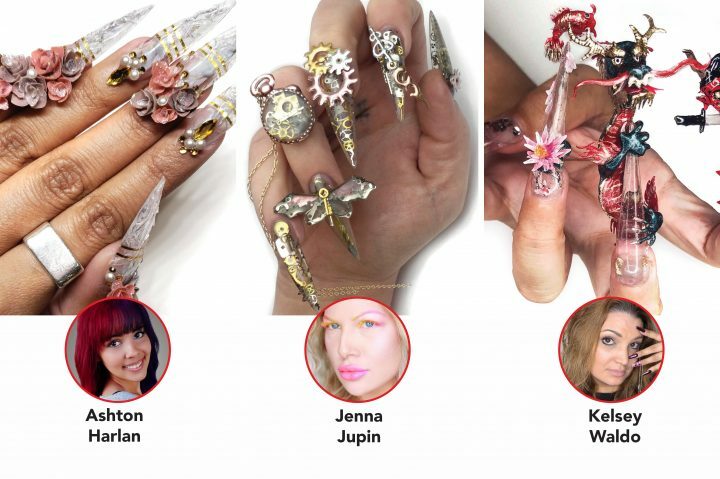 The judges were torn when it came to your icicle design, so consider carrying that theme all the way through to the top of the nail or do something more cohesive on the undersides next time. Nixxi: The judges adored your use of natural materials. However, the whole thing all together appeared a bit messy. Better lighting and a clean background will declutter some of the images in your video. Stella: There’s no doubt you thought outside of the box for this design. You brought really cool ideas to the table, but ultimately, they may not have been cohesive enough for all of the judges. The cube in particular was a very cool technique to watch! Ashley: Your bubbles were beautiful, but the judges wanted to see more techniques and different designs from you. Jerilee: You set your intentions and gave us a great, meditative intro. However, the judges would have liked to have seen more elements in your final look. Melisa: The judges felt there was a disconnect between the elements and color story in your design. Also, make sure you’re not moving too fast in your video, so the judges can really take in all that you’re doing.